Those of us in the helping professions are susceptible to what is called “compassion fatigue”, as well as the run-of-the-mill “burnout”. Both have significant impacts on ourselves and our ability to support our clients, and thus are something we need to be educated about and maintain vigilant awareness of. Sadly, many of us never receive training on what they look like and what can be done about them. • Feelings of sadness, fear, apathy or hopelessness, anxiety, and depression. • Use of poor coping strategies – substance use, isolation, bottling up of emotions. As compassionate individuals are drawn to the helping professions, we are naturally more susceptible to experiencing compassion fatigue. Individual characteristics such as perfectionistic tendencies, over-assumption of personal responsibility, and lack of social support are further risk factors. Burnout is a common phenomenon among all high-stress or busy professions. In the helping professions, potential stressors include difficult clients, unsupportive workplaces, time constraints and large caseloads, and administrative or organisational demands. Compounded by our desire to assist our clients to improve and progress, and the lack of opportunity to process our emotional reactions to clients, burnout is a genuine concern in any helping line of work. • Eroded empathy with clients. • Apathy – previously conscientious work practices diminish. • Ongoing physical complaints – gastrointestinal symptoms, headaches, or recurring colds are common. • Relational difficulties in the workplace – blaming others, impatient, irritable or hyper-critical with colleagues or clients. • Feelings of disillusionment, resentment, or lack of fulfilment. Clearly, an individual’s experience of burnout impacts themselves, their clients, colleagues, and home life. Like compassion fatigue however, it is something that can often be prevented – or managed successfully if it has already set in. Before compassion fatigue or burnout has set in, it is important to recognise the potential for either or both to occur in a given setting. Assess your job and workplace for the potential stressors listed above, and honestly look at yourself for any of symptoms. Consider whether the workplace stressors can be minimised or managed in some way – if you are struggling with this, enlist the help of a trusted manager, colleague, or friend, as it’s common to be blind to different ways of doing our work when we feel stuck or burnt out. The next place to look for stressors is within ourselves. Often, we cannot reduce or change the difficult elements of our job when we are working for someone else, or dealing with large organisations such as those that provide funding – and the necessary bureaucracy that goes with them. As such, we turn our attention to that which we can control – our own processes and reactions. It can be difficult to recognise and accept when the source of our stress is within ourselves. It is understandably easier to blame systems, processes, and other people, but this is harmful as it keeps us stuck and powerless. Therefore, it’s actually good news – our own thinking and actions are the things we can truly control. Any easy place to start is with administration. Many of us get fed up with endless reports and forms to fill – but these are often procedures that we cannot change or influence in the structure within which we work. What we can control is how we approach this. For example, procrastination often comes in to play, making the situation worse by adding more stress in the form of missed deadlines. Consider whether your personal work practices increase your frustration with admin, and get support with adapting to a more streamlined process. And accept that the admin is what it is – raging against the machine only ends up increasing your own frustration and changing nothing. Secondly, consider how your life outside work can support you. We all know and preach the basics – sleep, exercise, nutrition, and socialisation. Are you following your own advice? Are you taking work home, whether on paper or in your head? A lifestyle that minimises the chance or compassion fatigue or burnout includes well-used time away from work, both physically and mentally. Seek and be open to feedback from your loved ones as to how you are doing in this arena. A more difficult place to look is within our own minds. Consider how you think about the elements of your job that you find most stressful. Are there particular clients that you dread seeing? If so, look at your own processes and internal responses to them. Are you interpreting their lack of progress as a reflection on your skill? Does it impact you when they are angry or stuck or in pain (physical or emotional)? Are your clients’ traumatic stories coming home with you? These feelings are common, and as conscientious and caring professionals we often personalise our clients’ responses and actions (or inaction). Burnout is often a result of our minds taking clients’ actions as reinforcement of what we secretly believe about ourselves – that we are not good enough, that we don’t actually know what we’re doing (imposter syndrome), that we are responsible for others’ behaviours. Taking vacation time is wonderful and helpful, but if the problem is within your own mind, it will still be there when you get back to work. It can be tricky to spot this, as it feels very true, and can occur below our conscious awareness. Our beliefs about ourselves, others, and the world around us are our filters for how we process events, and we’ve had a lifetime of practice with using them. However, it is possible to interpret our interactions with clients in more helpful ways, and this is where adequate supervision and support comes in to play. Many of us are fortunate to have access to a psychologist or other workplace-related counselling. Be sure to use it, and to explore your own reactions to clients — don’t just focus on discussing your clients’ problems. Doing this before the burnout or compassion fatigue hits is most effective, but it can also work to lessen the symptoms once they have started setting in. 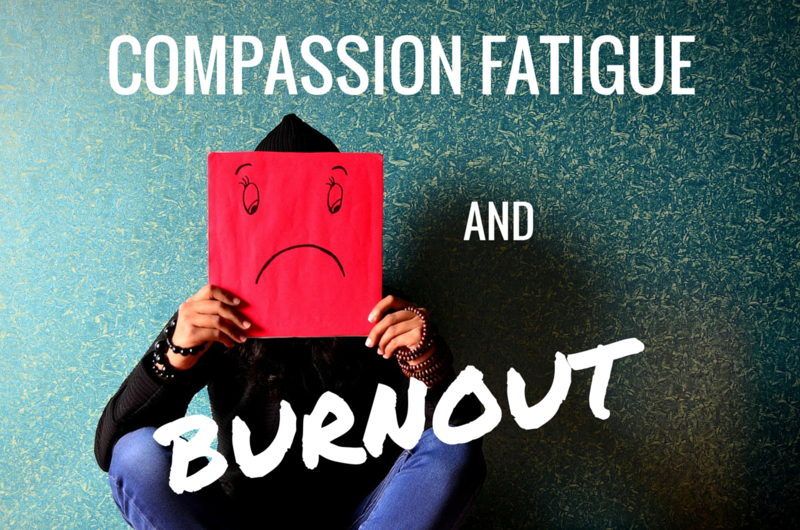 Compassion fatigue and burnout are real, common, and difficult to go through. The impact of them ripples out around us, and reduces our effectiveness in our roles – and it’s our desire to help that we hold most dear. Our openness to the reality of these two phenomena and discussing them with others reduces the chance of occurrence, as well as speeding our recovery if or when they hit. Thanks so much to Averil Linn for writing this blog for the naked physio. Averil writes her own blog called thisshortlife.com. She shares her expert knowledge in everyday experiences and challenges we face and how we can best address them. There is also a very excellent free mindfulness e-book that is packed with tips that you can use to help you in those difficult moments. Thanks again for reading, your comments are always welcome. Next Pain and Sedentary lifestyles: Is it a Paradox?